My first Camp KDE experience was when it was held in San Diego, which was also interesting since at that time, I just moved there. Just like the planets align themselves, apparent my move to the Bay Area is matched with this year Camp KDE in San Francisco. This time, it is co-located with Linux Foundation Collaboration Summit. For more info, just check the official site: camp.kde.org. The schedule for the tracks has been finalized, there will be various talks around KDE on Mobile, PIM, and of course Qt. I myself will have two presentations: Introduction to QtWebKit and Efficient Graphics with Qt: Beautiful and Blazing Fast. The other talk Compiling and Optimizing Your Own Browser with WebKit (vimeo.com/18780399 for the video, http://slidesha.re/fPSvXX for the slide deck), mostly showing few tricks you can leverage to understand how your web applications work. For example, by using QtWebKit and capturing all the drawing commands and the corresponding timestamp, it is very easy to have a slow-motion rendering of your web page. As I showed it in the talk, it is even possible to go back in time, i.e. rendering your web page backwards. Many other videos from SenchaCon 2010 have been published as well. Make sure you check them out. On the hand, surprisingly PhantomJS generates more interest than I ever imagined before (with over 240 watching its repository), prompting me not to abandon it too soon :) In fact, I decided to dump my tought on its roadmap since more and more people are willing to help. 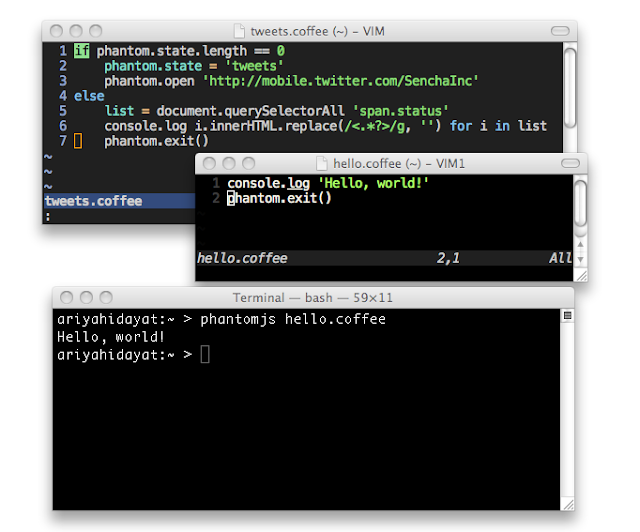 My secret feature, which is not secret anymore, for the upcoming 1.1 release is to incorporate the CoffeeScript compiler so that PhantomJS scripts can be written in CoffeeScript. Since the intention of PhantomJS is for various scripting purpose utilizing headless QtWebKit, this is a perfect match.